Free Junior Coaching @ Minnesota Fats! PMK Qualifier @ Lucky-Break Clydebank! Junior Tour 3 – Exquisite Cues ScotlandChampionship @ Davis Snooker club, Ayr! 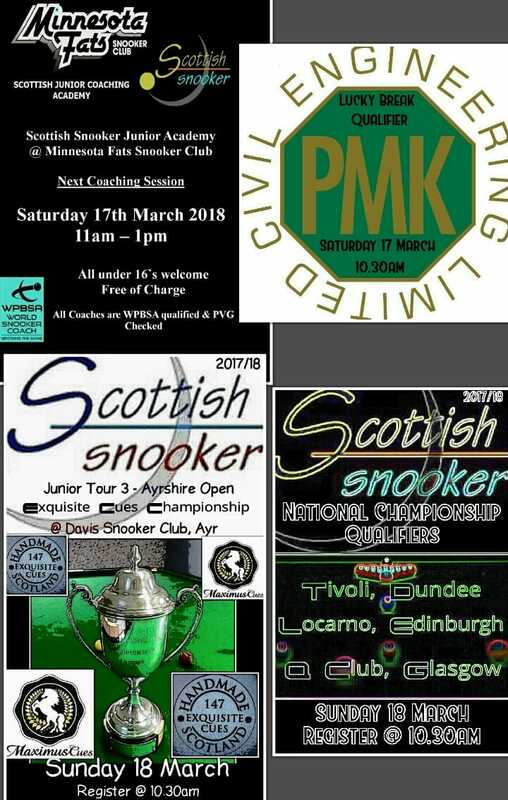 This entry was posted in Scottish Snooker and tagged Junior Tour Event 3, Main Tour 2017-18 Qualifiers, PMK Qualifier, Scottish Junior Coaching Academy by Robert Simpson. Bookmark the permalink.